This lovely unit is located on the 20th floor away from the pool area. Get the perfect amount of peace and quiet when renting this 2 bedroom, 2 bath beach front condo. The master bedroom is located on the water and has a king size bed, the guest bedroom is located towards the front of the condo and has a queen size bed. This unit does not have a sleeper sofa, therefor it can only sleep 6. This unit has a reclining couch in the living room and flat screen televisions throughout. Do not hesitate to book this unit for your family vacation today! 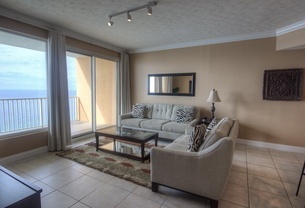 This is a beautiful Deluxe 2 bedroom 2 bathroom unit has a breath taking view of the Gulf of Mexico. This unit has tile in the kitchen and dinning area. The living room has a large flat screen TV/DVD and seats 7, the dinning area seats 6, the bar seats 3, and the balcony has seating for 7 with an additional 2 folding canvas loungers. The guest bedroom has a small flat screen TV/DVD and the master has a medium flat screen TV/DVD. Master bedroom has a king size bed, 1 queen in the 2nd bedroom. There are 2 twin sized bunk beds in the dinning area and a sleeper sofa in the living room. The washer/dryer are side by side. The vacation of your dreams can begin right here. This luxurious unit is sure to put you on island time with it's lounge chairs on the patio and recliner in the living room. It is located on the east side of the building away from the pool area with a perfect view of the gulf front. This unit has a king in the master, queen in the guest, a sleeper sofa and twin size bunk beds that can be accessed through the dining area or hidden behind closet doors. Bring the family and friends or keep it to yourself, either way you are sure to enjoy the accommodations in this unit. This 3 bedroom 2 bath Deluxe unit has breathtaking views of the Gulf of Mexico, St. Andrew bay, Grand Lagoon, and North Lagoon. This unit has carpeting in the bedrooms and tile throughout the rest of the unit. The living room has large flat screen HD TV/DVD and seating for 6. The master bedroom king bed and a medium flat screen HD TV. The guest bedrooms both have medium box TVs. One guest bedroom has a king bed and the other has bunk beds with a full on bottom and twin on top. The dinning area has seating for 6, the bar seats 4, and the balcony has 6 chairs and 1 lounger. This is a gorgeous 2 bedroom 2 bathroom Luxury unit with an unbelievable view of the Gulf of Mexico. There is tile throughout the unit. The guest bedroom has 2 queen beds and a medium flat screen TV and DVD player. The master bedroom has a king bed and a medium flat screen TV and DVD player. Guest bedroom ha a two fulls. The dinning area seats 6 and has 2 twin sized bunk beds. The living room has a large flat screen TV with HD channels, has a DVD player and seats 6. The balcony has 3 chairs and 2 loungers. All appliances have been upgraded. You will feel like you are in the lap of luxury while on vacation in this unit. This 2 bedroom 2 bathroom Deluxe unit comes with a picturesque view of the Gulf of Mexico. This unit has tile in the kitchen and dinning area; seats 5 in the living room, 6 in the dinning area, 4 at the bar, and 4 chairs and 1 lounger on the balcony. There is a large flat screen TV in the living room, medium flat screen TV in master bedroom, and a small flat screen TV in the guest bedroom. There is a king bed in the master and a queen in the guest bedroom, sleeper sofa, and twin sized bunk beds in the dinning area. The washer and dryer are side by side. Come kick your feet up on the balcony and watch a sunset on the Gulf of Mexico. This luxurious unit offers a 50 inch flat screen TV in the living room and a 42 inch flat screen in the master bedroom. It has a handicap accessible shower in the master bathroom. This unit is colorfully decorated to brighten anyone's day on their vacation. It offers a king in the master, a queen in the guest, sleeper sofa, and twin size bunk beds that can be accessed through the dining area. This 2 bedroom 2 bathroom beach front condo is everything your family could need and more for their vacation. It offers a spacious floor plan with a king size bed in the master, queen in the guest, and bunk beds in the dining area. The family room and master bedroom both walkout onto your huge balcony that overlooks the emerald green waters. When cooking in the well equipped kitchen you can observe the gulf view as well. This condo is away from the pool deck area giving you more privacy and quietness. This unit is sure to please everyone in the family with its beautiful decor and furnishings throughout. With jaw dropping views of the Gulf and a short walk to St. Andrews State Park, Treasure Island #1507 is the perfect choice for your next Florida getaway. Start each morning by cooking a delicious breakfast in the fully equipped kitchen and enjoy it while sitting on the large, private balcony listening to waves softly crash on the shore. The master and guest bedroom comes with a queen bed, carpeted floors, and flat screen tvs. The living room offers a flat screen tv as well as a queen sleeper sofa. A set of built in bunk beds are adjacent to the dining room and are the perfect sleeping alcove for the kids. This unit is guaranteed to make you feel as comfortable as staying in your own home but with all of outstanding, desirable amenities. 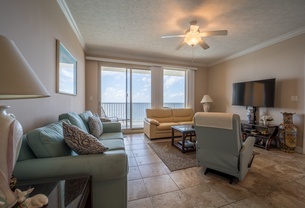 Treasure Island #2110 is a prime choice for your next group getaway along the beaches of Northwest Florida. This Panama City Beach condo offers ample space for up to six people and serves up unbeatable views of the clear emerald green water and sparking white sand. The private, covered balcony is the perfect place to enjoy your morning beverage while listening to the gentle surf or unwinding at the end of day while watching a breath taking sunset. 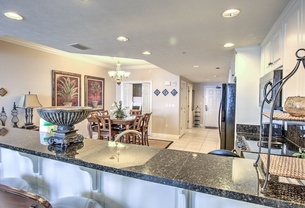 Enjoy cooking in the fully equipped kitchen, decorated with new stainless steel appliances and granite countertops. Of if you prefer, you are within easy walking distance of several local restaurants. The master suite comes with a king bed and a newly renovated adjoining bathroom featuring a double-sink vanity, a walk in closet, comfort height toilet, and tiled shower with dual shower heads. The guest bedroom also features a king bed. The newly renovated guest bathroom features a large walk-in tiled shower with dual shower heads and a comfort height toilet. This 2 bedroom, 2 bath deluxe unit is one to please the whole family. It sleeps a total of 8. A king size bed in the master, 1 full size bed in the guest, and twin bunk beds located off of the dining room area. This unit does have a sleeper sofa. It's huge balcony that is only on the 4th level makes the perfect birds eye view to look over the pool deck. Among looking out at the pool deck you will also see the most spectacular sunset across the horizon. The living room can seat 6 along with the dining room. There are flat screen televisions in both bedrooms and the living room. Bring your spouse or bring the whole family, everyone is sure to enjoy themselves at Treasure Island Resort. This shabby condo is sure to please anyone with an outspoken personality! The decor is sure to brighten your mood and make your vacation a little something extra ordinary. This is a 2 bedroom, 2 bath deluxe condominium! The wood like flooring is sure to keep your feet clean and the upgraded bedroom furnishings are definitely going to help you sleep great at night and wake up feeling refreshed! There is a king in the master bedroom, a queen in the guest bedroom, and twin size bunk beds hidden behind closet doors in the dining area. This beachy condominium is sure to benefit you if you are wanting to have easy pool access. The furnishings give the unit it's beach like personality and the patio is equipped with a table and chairs to satisfy those who enjoy the gulf breeze. It is also pet friendly for those who wish to bring their pets with them. This unit offers a king in the master, queen in the second, sleeper sofa and twin size bunk beds that can be accessed through the dining area or hidden behind closet doors if not needed. This unit does have televisions in both bedrooms and the living room.